Have you ever experienced the thrill of finding the perfect gift… something you simply can’t live without? This happens to me often, but even more so when I am around objects and people that inspire me. One of my favorite places to shop for these inspired items are at local art and craft shows. With the onset of fall, you can be sure these events will be popping up all over the state. This is a great chance to shop for the upcoming holiday season while emerging yourself into local artistry. To me there is nothing better than purchasing that one-of-a-kind gift and knowing you are helping to support the livelihood and creative energy of an artist. Even better, you can talk with those artists and gain an appreciation for their craft, whether it be knitting, painting, wood carving, etc. The amount of unique items at these events are definitely worth the trip. I believe there is something to be said about local artists coming together to display and sell their work. The differences between the artists are vast but they are all there for the same purpose, to share themselves and their art with others. This, to me, is inspiring. One of the biggest Indiana art fairs is fast approaching. 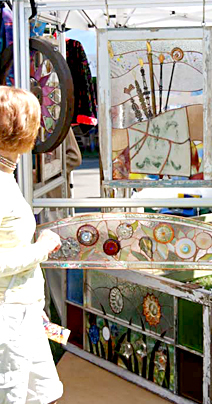 The Penrod Arts Fair (aka: “Indiana’s Nicest Day”) will take place on the grounds of the Indianapolis Museum of Art on Saturday, September 6. This year they will feature over 300 artists, an Indiana Craft beer garden and six stages of live entertainment. It’s the perfect place to shop and celebrate the arts/culture of our local communities. If you have never been, I encourage you to attend this year. Who knows what you might find!